Idea Jawa Yezdi 250 began its production in India in 1978 under the brand name Yezdi and was also known as the Yezdi Roadking popularly by its users. The bike is powered by a 246.3cc, twin stroke, air cooled engine with twin exhaust and kick start. The bike was a successor to Yezdi Oilking. It runs at a maximum power of 16 bhp @ 5000 rpm and gives out a torque of 23.8 Nm @ 4250 rpm, which is a great performance even when compared to modern 250 cc bikes of today. The bike comes with a 4 speed manual gearbox. It is remembered by its fans for its great performance and engine capabilities. The classic bike boasts of a top speed of 120 kmph and it makes to 0-60 kmph in just 4.10 seconds which is quite impressive. The bike has a wet weight of 144 kilograms which makes it count in the heavy vehicle segment. The Yezdi enjoyed a glorious run for 18 years and the company stopped its production in the year 1996. As of now this bike is sold solely in the used bikes market. The bike has a class and appeal which makes it to the hearts of the people who still remember riding it in the 80's and 90's. Its performance and features can also be compared to a modern day Royal Enfield which still enjoys following amongst the Indian fans. The bike comes with a front suspension of 130 mm travel and a rear shock absorber suspension of 100 mm travel. The Jawa Yezdi looks a lot similar to Yamaha RD 250. Both Jawa Yezdi and Yamaha RD 250 come with a 2 cylinder engine. 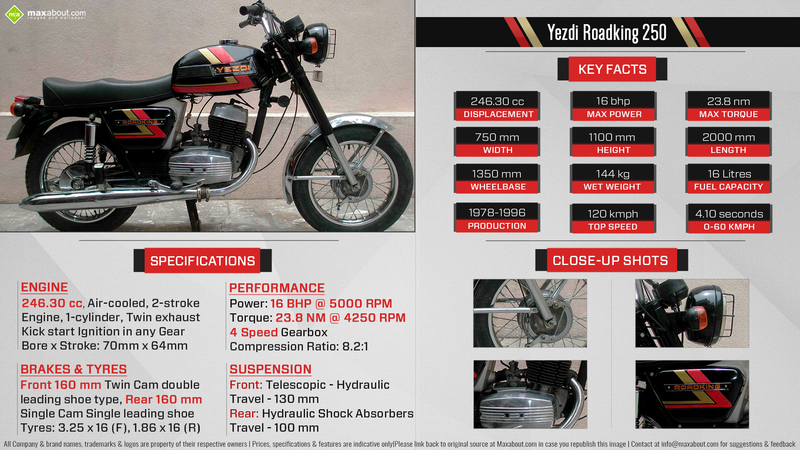 Although performance wise Yamaha RD250 outperforms Jawa Yezdi.